Update: a ‘gateway’ study has just been published (13 June) and lots of dupes have duly fallen for it – see “Study published” below. Beware! Here is an eight-point guide to evaluating such studies and the politically motivated claims that often go with them. 1. Is it clear what is meant by a gateway effect? …there is harmful gateway effect if young people who would not otherwise smoke take up vaping and, because of vaping, they develop a consolidated smoking habit that they would not otherwise have developed. In this definition, the introduction of an option to vape causes the more serious problem behaviour, smoking. But you need to know what would have happened in the absence of e-cigarettes – something that is notoriously hard to forecast, and no studies so far have done this – and it is not clear how they can. Updated. .A further consideration is the magnitude of these flows. How many people have to pass through a transition from vaping to smoking caused by vaping before a gateway effect is declared to be real? Is it just one instance of one person in one place somewhere in the world? Or do we need to see a substantial population flow through this route before it a material concern i.e. comparable with other pathways to risky behaviour? So what threshold should be applied, and what test would measure whether such a threshold has been breached? If e-cigarettes really are creating a gateway effect, are there lots of young smokers appearing the other side of the gateway? If smoking is declining rapidly, that should reinforce your scepticism about gateway claims. In fact, teenage smoking in the United states is falling and falling fast. 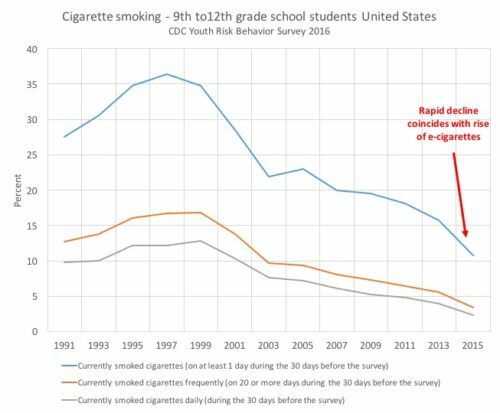 The CDC Youth Risk Behaviour Survey contains revealing data and chart – replotted by me showing rapid declines in smoking prevalence, including the more problematic frequent and daily smoking prevalence. It might be objected that smoking would have fallen even faster had there been no e-cigarettes. But actually the rate of decline (annualised percentage change in smoking prevalence) between 2013 and 2015 is the most rapid in this dataset and coincides with the rise of e-cigarettes. Maybe the rate of change of the decline would be even greater without e-cigarettes…? (and so it could go on). But then some heroic theory is required to explain what is driving the underlying smoking rates down so fast, while e-cigarettes and a gateway effect are somehow pushing them back up? It’s just not plausible. Note, I have been careful not to say that these trends conclusively prove that there is no gateway effect. They don’t. But they do make it harder to explain why a study purporting to have discovered a gateway effect can be reconciled with a steep downward trend in smoking. 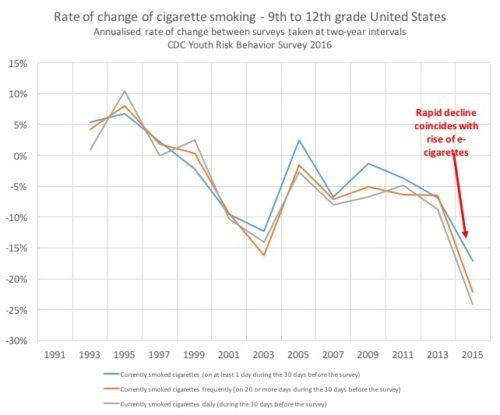 If smoking rates were going up or stalling, proponents of the gateway effect would be citing this as prima facie evidence. It is irrelevant which comes first – the first puff on an e-cigarette or the first puff on a cigarette. It is better to think of a period of experimentation or messing about eventually consolidating into more entrenched habits. The gateway effect arises if the vaping habit causes a smoking habit that would not otherwise have arisen. 4. What do they mean by ‘smoking’ and ‘vaping’? If a survey characterises smoking or vaping status by measuring ‘ever use’ – i.e. it counts someone as a vaper if they have taken a single puff ever, and similar for smoking, it is not actually measuring vaping or smoking habits. It is measuring experimentation or ‘messing about and being a kid‘. It may be making the amazing discovery that “people who try stuff, try stuff”. Something we have discussed before – see JAMA paper finds some adolescents experiment with stuff – so what? How is just playing with an e-cigarette supposed to cause anything? A realistic approach would count vaping and smoking habits as frequent use – daily or several times per week. Ever-use is particularly useless as a measure because it might be that after trying vaping or smoking, the user didn’t like it and stopped. How much of a problem is someone who tried vaping, tried smoking and then went on to do neither? If the study just measures ever-use, the authors have no idea how many of the subjects are or were regular vapers. Supposing kids were just messing about with e-cigarettes but didn’t become regular vapers and opted for cigarettes instead? Maybe what would have made the difference for them would have been more attractive e-cigarettes designed to appeal specifically to them! 5. Was nicotine used in the e-cigarettes? If the study didn’t check whether nicotine was used, it probably doesn’t tell us much or anything. 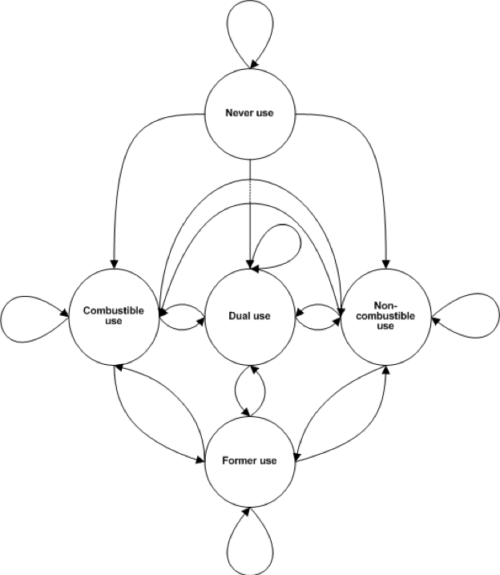 Given the difficulty of actually showing whether there is a causal relationship (see below) from usage patterns a further strand of evidence may be to look for proxies for potential causal mechanisms. If they are absent or small, that may give some greater confidence that the study shows no basis for concern. A study finds a pronounced association between two behaviours, A (e.g. vaping) and B (e.g. smoking) – for example, the study finds a high chance that someone who vapes or has vaped in the past also smokes or smoked in the past. Three mechanisms are possible to explain this. A causes B: they’ve found a ‘gateway effect’. B causes A: this is what you would see if young smokers were keen to try vaping to quit or reduce their dependence on smoking. The e-cigarette use only happens because they were smoking. This is known as ‘reverse causation’. C (a third factor or set of factors) causes both A and B: maybe the same things that incline adolescents to smoke also incline them to vape (e.g. parental smoking, rebellious nature, peer group bonding etc). That is sometimes called ‘shared liability’ or ‘common liability’ (see Vanyukov MM et al, 2012) . More generally, this effect is known as ‘confounding’. Before anyone can claim that A causes B (a gateway effect) they would need to consider what would happen in the absence of e-cigarettes – in the case of explanations 2 and 3, the kids would just smoke: the emergence of e-cigarettes is a diversion from smoking and positive for health. This is discussed is my posting: We need to talk about the children – the gateway effect examined in which I show that the most likely pathways that young people will take improve with the addition of e-cigarettes as alternatives to smoking. In an excellent recent paper, Levy et al explore similar themes. The third option above is the most common sense plausible mechanism for explaining a strong correlation between vaping and smoking. 7. Are measures of susceptibility to smoking reliable? Some studies try to get over the confounding problem (3 above) by using measurements of ‘susceptibility’ – i.e. by measuring personal characteristics that predict for smoking or vaping. If they find a large number of people who would be unlikely to smoke, but they go on to vaping and smoking, they may have found circumstantial evidence for a gateway effect. Well, that’s the theory anyway. The problem is that this is a very inexact science, it is actually very hard to predict who will smoke, who will vape and who will do neither. A common way of measuring susceptibility is to ask a young person if they intend to smoke in the future. Unless they answer “no, never” they are deemed susceptible. But all kind of things change in a teenage life and these commitments are far from binding! A good way to examine the utility of a susceptibility measure is to see how many of those deemed susceptible actually do go on to smoke. If it’s only a modest fraction, then the measure probably isn’t much good when used the other way around – to show that teenagers who are deemed ‘not susceptible’ go on to vape and/or smoke. A further obvious fact is that teenagers change all the time – their attitude to smoking might be resolutely against one day, but then a new girlfriend or boyfriend might sway them in the opposite direction the next day. Does the study look for people who would have smoked but are vaping instead? Are the pathways from smoking to vaping properly explored? Did the study include people who were smoking in the baseline so that we could track what happened to them if they vaped? Maybe they would have become vapers or quit completely via vaping? Presenting only the behaviour change of vapers, and not smokers, at the baseline creates a strong distortion in describing the smoking-vaping interaction. More broadly, does the study consider all the pathways in and out of combustible (very harmful) and non-combustible (not very harmful) nicotine products? For example using a model like this from Cobb C et al… and if not, why is the study just looking at one part of this system of possible transitions? To do so, is an implicit admission of investigator bias. There are just too many desperately biassed academic papers making ridiculous claims based on data and methods that could never describe a gateway effect. We should be looking at what is happening to the main trends in youth smoking, and this shows rapid declines in smoking and at a faster rate as vaping has risen. When you look at the full picture the data far more consistent with the vaping gateway being an ‘exit’ from smoking than an entrance. If activists, regulators and politicians realised that vaping was more likely to be reducing teenage smoking than increasing it, they might be less inclined to pile on extreme regulatory costs, burdens and restrictions and so compromise the options available to adults to switch from smoking to vaping. Counterfactual – JAMA paper finds some adolescents experiment with stuff – so what? And now a study is published and dupes most of the media into believing it’s found a gateway effect. FDA Vape Regulation "Logic": Save Kids, But Screw Tax-Paying Adults? Nicotine clears the system in 3-5 days physically. The part that can’t be dealt with through the passive use of gum or patch is the psychology of smoking. We develop muscle memory for the physical actions associated with the reward and unlearning is incredibly difficult since most of it is subconcious and not under direct control. How often did we think through the steps of smoking? Not one smoker I know talks about how much they enjoy it. For me the best part was opening the new pack. Everything else was automatic. You don’t see media of any kind touting the “pleasure” of smoking cigarettes. Vaping on the other hand has a significant following where people speak of positive effects like no cough, no colds or flu and no one backing away from you at the grocery store. Regulators are hired to regulate and when obvious threats are controlled we have look for something to keep the excitement up. If nicotine is that dangerous, why allow the patch and gum that can certainly be abused by kids. Abusive personalities will always find something. Remember “Reefer Madness”? All who have ever tried the stuff are on an express trip to heroin addiction. We also needto quit referring to vape gear.as e-cigarettes which only reinforces the government definition. Bubble gum flavour is very interesting; I first became aware of it when listening to a chap named McKee, for the life of me, I cannot remember if it was in a video or I voice read some text. The unique selling point of bubble gum is that you can blow a bubble with it. The last time that I chewed some, I must have been eight or nine years of age. I stopped using it, as once you have blown a bubble or two, it was rather puerile. Now, given that the unique selling point for children is the ability to blow bubbles, what stretch of the imagination possesses someone to reiterate that a flavour attracts children, when the Unique Selling Point is not in existence. I vape bubble gum flavour, my grey beard indicates that I am not a child. The point of bringing this up is important, with regard to mind-set. If the aim is to eradicate every vestige of the Tobacco Industry, surely it indicates a “Lack of Moral Fibre” to even suggest that if someone vapes a particular flavour they may at some later date take up smoking tobacco cigarettes. The Tobacco Industry by that time will be eradicated? The spurious argument that children will start smoking indicates that the goose that lays the golden egg will be alive and well, so there is no wish to eradicate the Tobacco Industry. The “think of the children” mantra is a tacit admission that there is no plan to end tobacco consumption. The raft of legislation that its creators purport is to protect the children, gives the game away. If for instance when, Boris, I ain’t got no comb, Johnson, was Mayor of London, he had decided that new regulations were required for horse drawn fire engines, apart from thinking he was mad, madder than anyone suspected or ill advised by a scoundrel. The main message would be that horse drawn fire engines were coming back and to stay for a considerable length of time. Beautifully argued, Gummy Bear. Makes perfectly good sense too. Sadly, logic and common sense appear to have become outdated, unfashionable and irrelevant when we’re talking about vaping. The number of bodies and institutions involved whose agendas disregard and even conflict with such (former) virtues seems ever-increasing, along with the desire of governments and corporations to exert ever-greater control over the lives of as many individuals as they possibly can. When I first moved to vaping rather than smoking, this was one of the most positive things to happen to me in a long time. Regrettably, the unforeseen consequences of this personally wonderful event have included numerous unwanted and unwelcome side effects; over the past few years, I’ve had my faith and confidence in various things utterly destroyed. A few examples would include: belief in the scientific method and the objective viewpoint of those who claim expertise, intelligence and open-minded attitudes in the medical profession (most particularly those involved with public health), alongside any expectation that I could hope to be treated with any kind of respect by any of the human cogs in the machine of ‘democracy’. Having passed my half-century some time ago, my trust in the media to do anything like a useful job of reporting the facts was already long gone along with other childish attitudes, but even so I remain shocked and appalled by the depths plumbed by some of it’s representatives. Wendy, this is sad to hear. Don’t lose your faith in the scientific method, though. It’s still the best we have to generate knowledge. What we see in this field is exceptional. Science is certainly messy and often marred by power struggles and potitical agendas. But in most fields there are still mechanisms that sort out the worst crimes. You can’t just make up stuff and get away with it. That this has totally failed in tobacco control isn’t representative. Just don’t consider the Chapmans and Glantzs scientists or experts. They are not. It seems that people – vaping advocates included – don’t realise how self-defeating the gateway argument is. 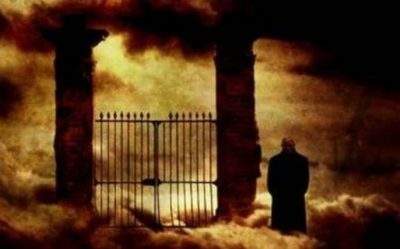 Let’s look at how the gateway works. Kid gets attracted to that lovely bubblegum vapour. Then kid becomes totally hooked on nicotine. Because of the nicotine addiction (kid must be a chain-vaper by now) kid switches to some other method that tastes very much not like bubblegum but kind of hits harder. So kid becomes a smoker. What matters is not that this theory is somewhat implausible. What matters is that the gateway effect, if it happens, happens in broad daylight. You know it when it hits you. Your partner will notice. Your friends. Perhaps the teacher. If it happened in large numbers, the media and the internet would now be awash with confessions of gatewayed kids, Gatewayed Anonymous self-help groups, doctors reporting the epidemic of gatewayed kids among their patients. But instead there is complete silence. No gateway victim has come out, no-one seems to know anyone who actually has been gatewayed. 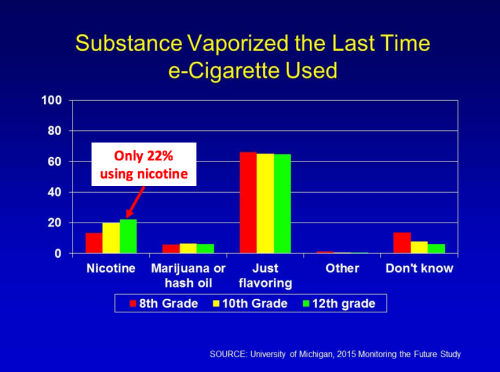 According to the CDCs, a quarter of youths “use” ecigs. If there are such “alarming” numbers of kids trying a “highly addictive” drug, then surely there must be quite a number of addicts by now. And hence gateway victims. Many thousands, if not millions. To quote Fermi’s paradox, where are they? Of course, one might expect that many gateway victims could be too embarrassed to come out, and are very good at hiding their habits. But the gateway claim involves big numbers (if it were a handful, it wouldn’t be a public health issue). Seriously, millions of victims well aware of what happened to them, and not a single one comes forward? That must be the conspiracy of the century. Clive’s article excellent as ever – thanks, as always. The number of his articles which I want to shove under the noses of all the ignorant nay-sayers and legislators continues to increase each time a new one appears; most particularly of course the likes of the politicos who have managed to convince Lord Callanan to downgrade his ‘fatal motion’ on the TPD implementation in the House of Lords to a ‘motion of regret’ only this week. Thought it was too good to be true that we might at last find something the House of Lords was really good for. Pity. My own story is very similar to Christine’s aside from living in the UK, being a few years younger and never having been pregnant. I never managed to give up for more than a few days in my numerous failed quit attempts. I too was coughing really badly at night and petrified that I was killing myself but still could not stop smoking. I discovered vaping late in 2008 and by early 2009 was completely tobacco-free and have been ever since. I did my own research and reached approximately the same, perfectly valid conclusions as the NHS and the RCP have recently, almost EIGHT YEARS AGO. Why so slow, chaps? I’ve mixed my own liquids for most of this time and now have a freezer-full of high-strength UK-made nicotine base and numerous flavouring concentrates to ensure my own supply of whatever nicotine strength I care to mix, as I continue to use nicotine, including higher than the TPD permits when the mood takes me. Fortunately, I’m also well aware of alternative routes of supply which should ensure that I can continue to vape as I choose. Yes, I’m one of the few hundred thousand people in the UK the TPD has happily thrown under the bus. For the sake of anyone who is interested in the (very good) article Christine mentions in her comment above, I hope this link WILL work http://www.spectator.co.uk/2014/05/vape-alarm/ . It was indeed written and published (in May 2014, doesn’t time fly?) by Matt Ridley also known as Viscount Ridley, member of … the House of Lords. He makes an excellent case against the TPD, but sad how it highlights just how little his fellow Lords have learned in reality since it was written. A progression to something better, more fulfilling? To move onto smoking, which smells bad, tastes bad, costs more money, and above all else, is known to be bad for your health? There is no net gain. Smoking, it is something our ancestors once did. The problem is that all these “PH” cretins DO realize that vaping leads AWAY from smoking… and they just can’t have that — it would mean the end of the tobacco gravy train, and thus, their jobs — they might have to get REAL jobs, instead of being bullying, judgmental, puritan nannies for a living! No one in “public health” actually gives a rap about HEALTH, they just want dat money! And the opportunity to be bullying puritan nannies! I must stress that this matter is of the highest importance to me personally and of course pertains to millions of other people subjected to the awful addiction of smoking, which has now been scientifically and historically proven to cause severe illness and premature deaths. I live in Western Australia. I was born in England. I migrated here 18 years ago and still have very strong ties to my home country.I am 63, I was a smoker for 47 years apart from when I was pregnant. I went through hell to quit each time, it was the guilt of damaging my unborn child which got me through. Over the years I have tried everything to quit, all the usual NRT’s with the exception of Champix as I have suffered from depression and anxiety attacks, and suicidal thoughts. So after researching, I decided that this would be a dangerous path for me to take. Cold turkey did not work either, even after many attempts. 2 ½ years ago I hit rock bottom, I was smoking between 35-40 cigarettes each day, I was coughing so much all night that I became incontinent. This was the final humiliation. I thought I would die with a cigarette in my hand and life felt utterly hopeless. I knew I was in desperate trouble, so I ordered some vaping equipment with 24mg nicotine in several different flavours. Within I week, I had cut down from 40 cigarettes to 8 a day, it was a miracle. After 1 week my cough had almost vanished and I was no longer incontinent. A month later I had quit cigarettes completely. Vaping has saved my life, I am a completely different person to the sad unfit one I was 2 ½ years ago. If I had not had the opportunity to use this fairly high nicotine dose, with a good choice of flavours, I would have never achieved this. I of course have read numerous articles on the subject, but the one that still stands out for me is the following- E-cigarettes are making smoking obsolete, so why ban them? – Matt Ridley. I am afraid I cannot get the link to work, but it is an outstanding article, suggesting that smoking is going the way of top hats and crinoline. This point really stuck in my mind, a bit like the oft quoted “Kodak moment”.